There is a noticeable merging of classical telephony and Internet telephony (VoIP). E164 Number Mapping, abbreviated ENUM, is an important link between the two. The “PolyPhone” communication tool at ETH also takes advantage of this technology. The vision of being contactable everywhere on a single number seems to have come within reach. Skype is one of WWW’s more recent success stories and has now comfortably passed the figure of 100 million users with the software installed on their computers. Although VoIP providers like Skype took the home user area by storm, its development in the business area has progressed rather hesitantly up to now. At first the worries about deficient speech quality and patchy service availability were too great. Thanks to larger bandwidths these doubts have since been largely dispelled, at least as far as speech quality is concerned. That’s why the news has got around, even at small and medium size firms, that VoIP can supplement conventional telephony to save costs and make work more productive. However, a link between the two telephony worlds has been lacking until now. Communication even between individual VoIP systems was often impossible because they each had their own (proprietary) technical standards and protocols. That’s exactly where ENUM starts. 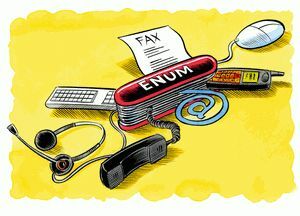 Put simply, ENUM is a directory that translates telephone numbers into Internet address notation. ENUM does this by using the Domain Name System (DNS) that has been established for many years. In a nutshell: based on a phone number it is possible to find out the communication service through which a person is currently contactable, provided his/her contact data for Natel, Fax, E-mail, VoIP, Web site etc. have been entered into the ENUM “data base”. 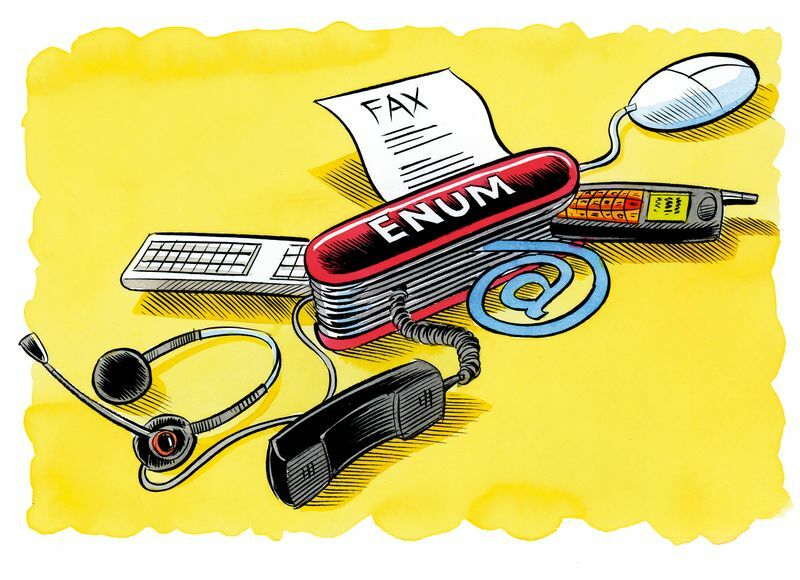 The ENUM directory service yields two advantages: ideally the caller can dial a quite ordinary fixed line number and can telephone free of charge via the Internet, bypassing the telephone company. The called person can in turn define where an incoming call is to be routed to and/or what happens when he/she does not answer the call. One of the possible variants with web-based services is Voicemail, which the ETH PolyPhone project also offers: voice messages on an answering machine are sent to the called person via E-mail. The plan is for ENUM to be expanded into a global directory service under the auspices of the International Telecommunication Union (ITU). However this is still a long way off because at present the system is operational in only a few countries; other countries, e.g. Switzerland, are in a test phase. Although the directory system is technically fully mature and tested, there are still administrative and regulatory questions remaining to be solved, as was apparent during a SWITCH (Swiss Education & Research Network) information day on the subject of ENUM. Although ENUM solves the problem of the seamless transition from classical speech networks to data networks, Bernhard Höneisen of SWITCH, the agency responsible for the Internet domains .ch (Switzerland) and .li (Principality of Liechtenstein) qualifies this by saying that, “It will be attractive only as a total package, for example with a VoIP offer." The fact that the big telephone companies have so far cold-shouldered the ENUM directory has also proved to be an obstacle to its rapid expansion. From the point of view of Swisscom & Co. this is entirely understandable since in most cases an entry in ENUM means telephoning via the Internet, which in turn means that the telephone companies cannot bill any charges for access to their own network. You can write a feedback to this article or read the existing comments.